Sambal Ikan Bilis is commonly found in many hawkers in Malaysia and Singapore, especially Nasi Lemak vendors. It is the main condiment to Nasi Lemak and can actually make or break the popularity of Nasi Lemak vendors. 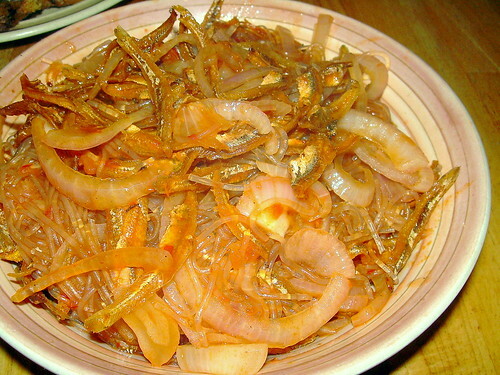 What is less common would be Sambal Ikan Bilis with Tang Hoon (glass vermicelli) as seen above. This dish is more often cooked at home rather than being sold outside. At home, we usually prepare the sambal (chilli paste) beforehand and keep them in the refridgerator for use as and when needed. Recipes differ from one cook to another and mine is actually a very simple no-frills version. Heat 2 tablespoons of cooking oil and fry ikan bilis till crisp. Remove ikan bilis and discard oil. Heat oil 2 tablespoons of cooking oil and saute sambal ingredients on medium heat till aromatic and semi-brown. Set aside. Next, heat up 2 teaspoons of cooking oil in wok and saute onions till beginning to limp. Add sambal and continue to stir briskly for 15 to 30 seconds. Add tang hoon and water and bring water to boil. Let the tang hoon cook for not more than 1 minute whilst you add seasoning. The water should be reduced by now. Return fried ikan bilis into the wok and mix well with the ingredients prior to serving. The fried ikan bilis is only added in prior to serving to preserve its crunchiness as against the softness of the tang hoon. The Nasi Lemak I eat in Singapore don’t have Sambal Ikan Bilis ar… there’s only the dried ikan bilis with peanuts. simcooks : So stingy one ar? LOL! This sambal ikan bilis is so versatile, put on anything also good taste! oh….Singapore nasi lemak cant compare with Malaysia nasi lemak. wow… that looks spicy indeed. No la. Not stingy. Just a different taste. Not everything is the same mah… just like Penang Laksa vs Singapore Laksa is different. The Hainanese Chicken Rice is also different. tigerfish : Your comment was earlier caught by my spamguard. Lol! Oh yes, those “small packets” are great! Quite difficult to find them in KL nowadays. I guess the vendors want to earn more money by selling “add-ons” such as curry chicken, sotong, etc. Neo : When u want to eat? tummythoz : To get crispy ikan bilis, I usually just rinse the ikan bilis (not soaking them) to get rid of dust or dirt. Heat up wok till smoking, add oil (make sure it is really hot) and fry the ikan bilis till golden brown. It almost always turn out crispy. I find that if I soak the ikan bilis too long, it does not always turn out crispy. i thought of trying this dish, but don’t like tang hoon.